Today, advancements in Microsoft technology, including SQL with R integration, have made it possible to capture large, complex data sets, which can be managed, mined and analysed to provide real-time data insights and predictions. At Objective IT our team of data scientists and consultants work with many technical and marketing directors to help extract value, insights and meaning from their corporate data. These insights can be used to recommend future actions or to guide business decisions. We find the team at Objective IT good at software development, SQL and data insights, and they are easy to work with. They fully involved themselves in the travel data project and contributed positively, innovatively and proactively. To help you react quickly, in a world that demands fast business decisions, Objective IT’s data insights consultants can reduce the time from raw, fragmented data to informed business insights through Microsoft BI database development and analytics, including SQL, R and Excel. Solutions to prepare better data and analyse information. Through successful data integration, we can help you generate a wealth of reports and dashboards to track and manage new sales leads, existing customers and your workforce. Aggregate multiple data sources into a data warehouse to gain a vital insight into campaign performance. We can help you build on your existing systems to create comprehensive marketing intelligence data warehouses and databases to monitor customer behaviour. Then, applying marketing analytics will predict trends and score leads to identify hot sales conversions. Improve performance and refine your company’s business processes with unified and enriched data to expose hidden trends and predict future outcomes. 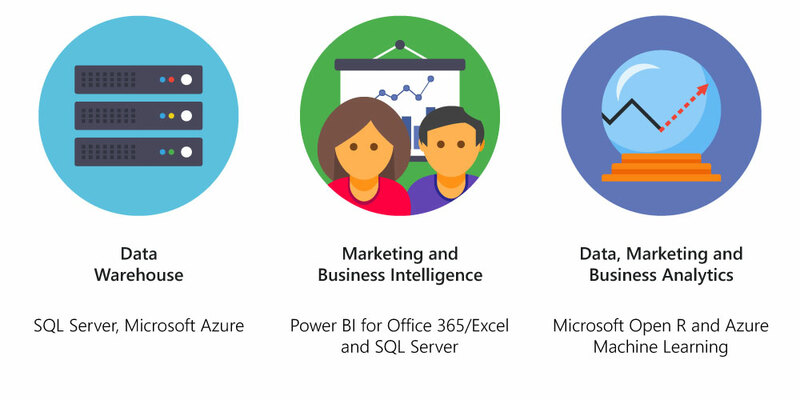 Our consultants, data scientists and developers will deliver clever application of Microsoft data analytics including SQL and R; creating bespoke advanced data insights to help you plan and execute your business strategy with confidence. With the help of Microsoft business intelligence database development, we can create in-depth Key Performance Indicator (KPI) reports to gather information on all kinds of metrics, from customer retention statistics to profitability data. Analytical reports can be created to help management identify which business and marketing efforts are the most effective and to predict trends with predictive analytics. Easy to use Excel tools can be used to extract insights of day to day operations.